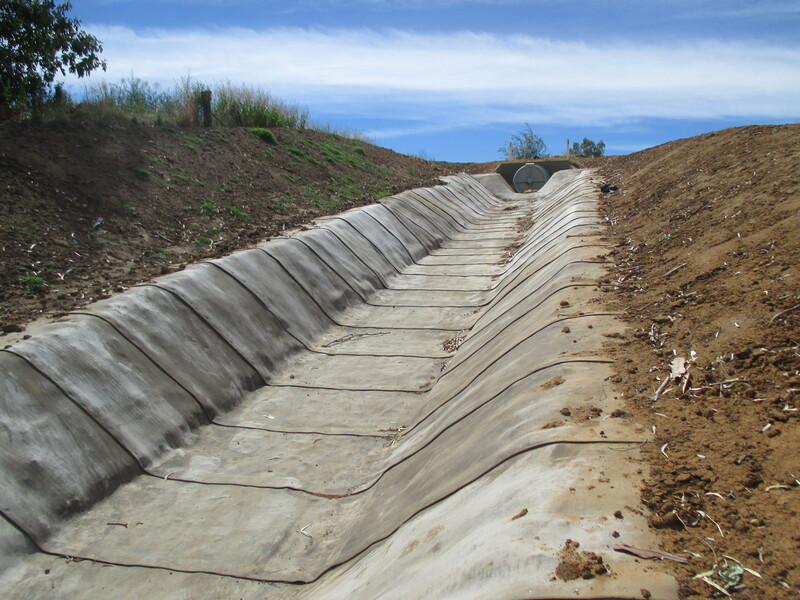 In January of 2018 Concrete Canvas was used by Cowra Council in New South Wales to rectify a failed open drain following a substantial rainfall event. The heavy rainfall event led to undercutting and eventual failure of the existing corrugated steel drain. Following a detailed proposal from Geofabrics Australasia, Council assessed a number of possible solutions and resolved to use Concrete Canvas on the basis of initial and whole of life cost, durability and ease of installation. The Concrete Canvas was supplied to Cowra Council in bulk rolls of 1.1m x 113.64m, and was installed by the Council construction team. The rolls were deployed utilising a lifting frame attached to the lifting point of an excavator. Due to the dimensions of the channel the Concrete Canvas was deployed transversely across the drain and laid in a roof tile fashion down the slope. Where required the Concrete Canvas was cut using a Stanley knife. The top of the Concrete Canvas was placed in an anchor trench and pegged with 380mm pegs. Council construction teams followed the installation guidelines set out by Concrete Canvas. The joints were folded back and hydrated. Concrete Canvas was installed in dry weather conditions however can be installed in inclement weather as it remains workable for up to 2 hours after hydration. An adhesive sealant is applied to the joint in an 8mm bead and the Concrete Canvas folded in place. The adhesive sealant used has been tested for grab and peal strength when applying to Concrete Canvas. The joint is finished with stainless steel screws applied with a screw gun at 200mm centres. The whole installation was then hydrated with water from a water truck. Concrete Canvas is quick to install compared to traditional concrete solutions, with the completion of the whole project taking just 3 days.